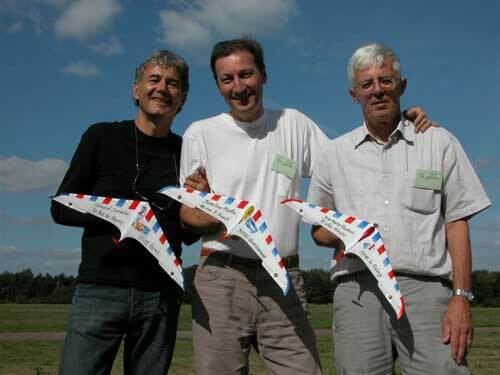 If these models fly together, there are less than 90 g in the air. The finish of these models looks like a real air mail letter. At this reason the V-50 of J-Y Martin got a stamp showing an airbus. The stamp was cancelled at the post office where he lives. The V-50 of Gerard Jumelin got a stamp with another airbus 340 and was cancelled in the post office in Paris. Only the V-50 of J-M Piednoir got a new stamp Gerard had in stock, to match the finish of the others. But I think Jean-Marie will make this new, with a stamp cancelled in the post office of his hometown. The silhouette of the head shows Gerards wife. A Piednoir / Jumelin design. 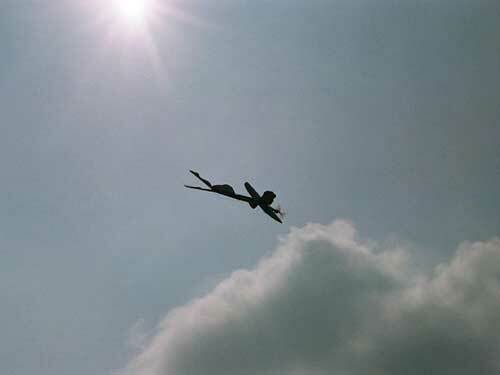 a pure Horten wing without elevons, the whole wing twists. 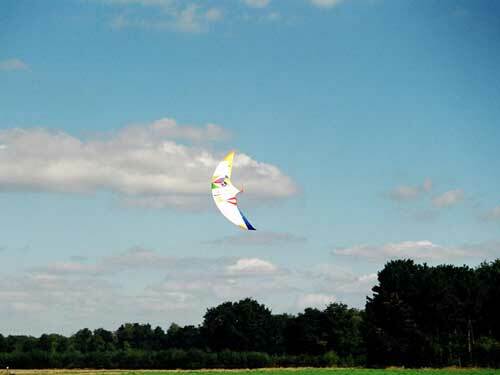 wingspan 130mm, 8 cells NiMh 210 mAh, DC 5,2-4 motor mit gear 1:11,8, carbonprop Wes-T. Built from carbon tubes and balsa ribs. 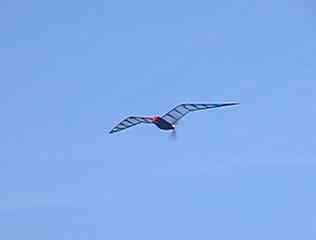 "Volage" a bird was published in RCM #252 april 2002.
wingspan 107 dm, weight 115g, Wes-T 2,4 servos for elevons, 8 cells 50 mAh. 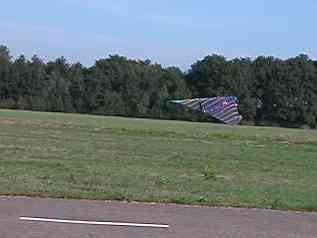 One 6g servo moves the head and tail, vectorial thrust for flat turns. Carbon socks and blue dyed balsa for the wing, carved foam, bals and ply for the head and tail. "la Luna" (ital. 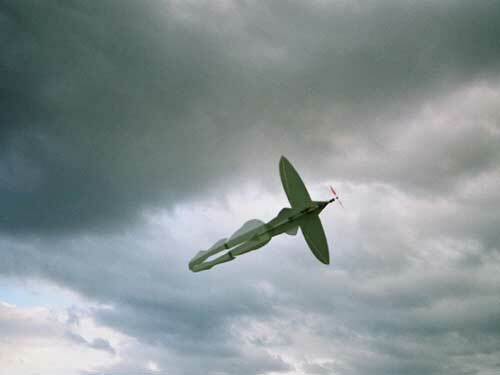 the moon, a homage to Federico Fellini´s movie "la voce de la luna"), a Horten-wing with 6mm Depron, wingspan 76cm, DC 5,2-4 motor with gear 1:6,3, propeller 6x5, JPM Solutions receiver and controller, GWS 6g servos, weight 77g, 2 Kokam LiPoly 145 mAh cells.